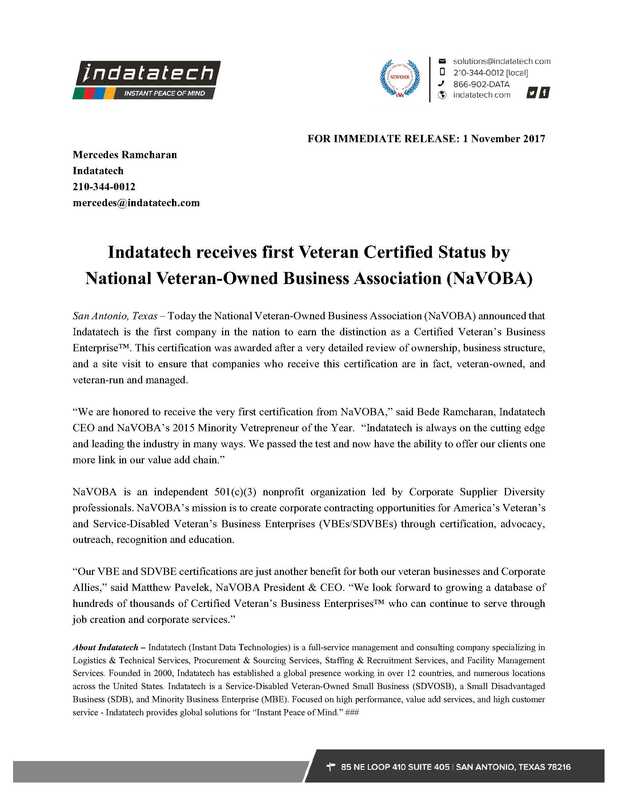 San Antonio, Texas – Today the National Veteran-Owned Business Association (NaVOBA) announced that Indatatech is the first company in the nation to earn the distinction as a Certified Veteran’s Business Enterprise™. This certification was awarded after a very detailed review of ownership, business structure, and a site visit to ensure that companies who receive this certification are in fact, veteran-owned, and veteran-run and managed. NaVOBA is an independent 501(c)(3) nonprofit organization led by Corporate Supplier Diversity professionals. NaVOBA’s mission is to create corporate contracting opportunities for America’s Veteran’s and Service-Disabled Veteran’s Business Enterprises (VBEs/SDVBEs) through certification, advocacy, outreach, recognition and education. Bede Ramcharan, President & CEO of Indatatech, has been named the 2015 Minority Vetrepreneur of the Year by The National Veteran-Owned Business Association (NaVOBA)’s Vetrepreneur magazine.